March 9, 2014 marked the five-year anniversary of the lowest point of the S&P 500 after the financial crisis, and we are taking this opportunity to highlight just how far markets have come since those dark days. 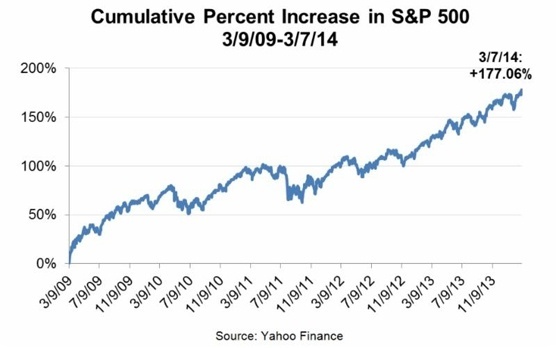 As of Friday's close, the S&P 500 has gained just over 177.0% since the market bottom on 3/9/09. The stock market growth we've experienced over the past five years has also been accompanied by some important gains in the economy. Today, the U.S. economy is worlds away from where it was in 2009, when we faced Gross Domestic Product (GDP) growth of a dismal -3.0%. The latest data we have shows that the economy accelerated by 4.1% and 2.4%, respectively, in the third and fourth quarters of 2013. The unemployment rate has also dropped from 8.7% in March 2009, to a five-year low of 6.6% in January 2014. Considering the strength of the gains stocks have made over the last five years, the big question on many investors' minds is: How much longer can the bull market continue? 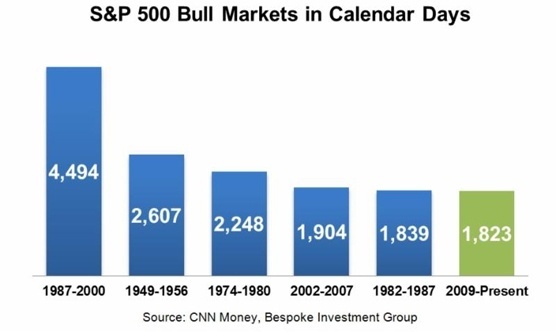 Though it's possible that we're approaching the end of the bull market, historically, this bull run isn't necessarily that old. The chart below shows the number of calendar days between the beginning and end of recent bull markets in the S&P 500 - broadly defined as a period in which the S&P 500 gains at least 20% without a 20% decline in between. You can see that the current one hasn't even cracked the top five. While we can't be certain that this bull market will continue, we can look at current economic fundamentals and market trends and make educated guesses about what may come. A lot of cash poured out of markets between 2008 and 2012, and not all of it is back in play. Though many investors have put their money back into stocks, there are still significant amounts of cash on the sidelines, suggesting that equities may still have growth ahead of them. Economically, the U.S. is chugging along steadily. Gross Domestic Product (GDP) growth is modest but fairly robust. The Federal Reserve is confident enough about economic performance that it's taking steps to remove monetary props. Job growth is slowly gaining steam. U.S. companies are doing reasonably well, and have been able to carve out earnings growth despite tough business conditions. And finally, market growth has been fairly broad-based, meaning recent gains haven't been shackled to the performance of a few high-flying sectors. Stock valuations and price-to-earnings ratios need to remain stable and supportive of stock market gains. While we can't be certain about which way markets will move, we can be fairly certain that volatility will be sticking around for a while. There is a lot of uncertainty in global markets right now and uncertainty frequently translates into volatility. While volatility can be stressful, it's important to keep it in perspective, and to try and think long-term. Overall, we're very pleased with how far markets have come in the past five years and we look forward to supporting you for the next five years and beyond. China's exports plummet on global uncertainty. Exports from the world's second-largest economy tumbled 18.1% in February, stoking fears about China's economic recovery. Analysts hope that seasonal variations around the Lunar New Year Holiday are responsible for the unexpected decline. U.S. household wealth jumps. The total net worth of U.S. households rose to a new high at the end of 2013, reaching $80.66 trillion as stock market and housing gains boosted wealth. Increases in housing value make it easier for Americans to borrow against equity, hopefully foreshadowing increases in consumer spending. Planned layoffs drop in February. The number of American companies planning to lay off employees fell last month, in a positive sign for the labor market. The number of planned job cuts fell by 24.0% as compared to February 2013. Utility bill scams on the rise. Higher winter energy bills are contributing to an increase in email scams. Fake billing notices from utility companies are arriving in inboxes across the country; clicking on links within the email could download malicious software or reveal sensitive personal information.